Have you always wanted to play in a concert or jazz band? Wish you could sing in a choir? Would you like to refresh forgotten musical talent? Want to have fun in a supportive group of adults? If so, we have a place for you in our adult community concert band, choir, or jazz band! The Concert Band that started it all! Join in January or September. Click to Learn About the Band! Our choir has spots for bass, tenor, alto and soprano. Come sing with us! Riverside Jazz is our swingin' Jazz Band. We love to play everything from swing, classic rock and Latin to straight-ahead jazz. This 20th Anniversary Seasons starts on September 4 & 5, 2018 and runs to early June with weeknight rehearsals at Bow Valley High School. Each year is divided into two sessions – you can start with us in September or in January. For all the details including rehearsal days and times, check the webpage for each ensemble. We love to perform! All ensembles entertain enthusiastic audiences at Christmas and Spring concerts each year with a donation to the Cochrane Activettes Food Bank or other charitable organization as admission. We also combine with BVHS music students in their annual Foodbank Benefit Concert. As well as these concerts, Riverside Jazz holds its annual Jazz Night. This is a real crowd-pleaser and tickets sell quickly! Help us mark this special milestone by joining us for our special concert on Saturday, May 11, 2019, followed by cocktails, a banquet and dance. Join us Saturday, May 11! Concert, Cocktails, Banquet and Dance. 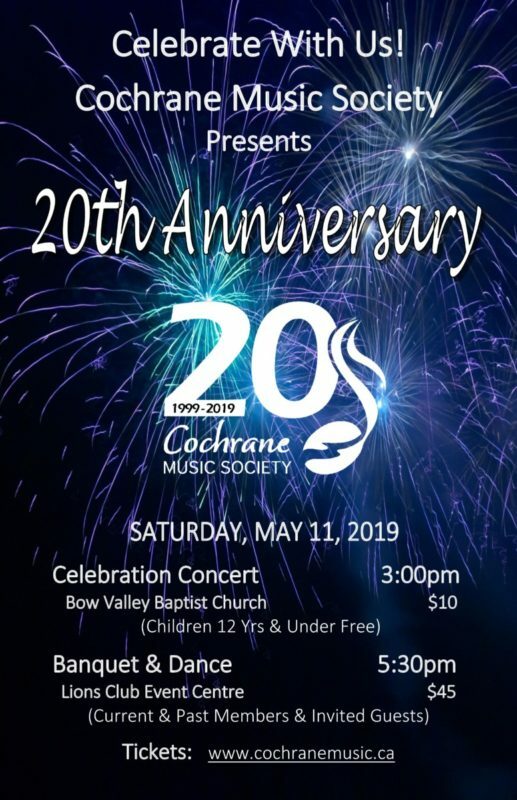 We’ve got lots going on in the Cochrane Music Society, and this is the best place to keep up to date, whether you’re a member or a fan & supporter!